Luxury Villa with Guesthouse directly by the sea with a sandy beach. One of the most elite places on the Bodrum Peninsula is the Yalikavak Bay. The luxury residence is situated directly by the sea, in one of the most exclusive parts of Yalikavak with a spectacular panoramic view over the bay and the International Marina. The property and the buildings are facing south. Enjoy the sun all day with an amazing view over the bay accompanied by sunrise and sunset. a bathroom with shower, a jacuzzie for two persons and a toilet, 3 rooms, 2 bathrooms, 1 toilet,1 storage room, a large entry hall with a gallery, spacious terraces with pavilions, a barbecue place with a pizza oven, a large party room with a bar and two toilets, a working room, a big garage with a workshop, 2 big depot rooms one ready to be used as a second kitchen, one servant apartment, one heating machinery room with three 500 liter solar boilers, fully automatic solar energy system for heating and hot water, oil heating system for sunless days. Direct access to the pool, garden and the sea. Water is as important as gold. The residence has his own artesian spring with a depth of 65 meters. Filtration units and an uv sterilisation system provides a very pure water, which is stored in two 2500 liter storage depots, a sewage plant which reclaims the waste water, which is used for the automatic garden watering system. 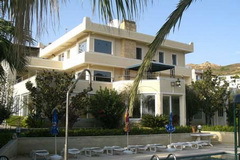 Groundfloor: 3 Apartments each 61m2 with covered terrace. 6 Apartments each 50,6m2 in the 1. and 2. floor with saloon,kitchen, 2 bedrooms, bathroom, airconditioning and covered terrace.